Maximus is an automated campaign management platform that operates in real time, giving users the benefits of increased scale and efficiency. Our Fire & Forget parameters are customizable, intuitive, and built with highly active media buyers in mind. The Maximus user experience is enriched by a full-service help center, live support, and hands-on management. Set a Site Goal Margin, Site Min Clicks, Site CPC Floor and Site CPC Cap for campaigns and the Maximus system will automatically adjust the campaign based on these parameters. Block a specific widget by clicking the BLOCK button next to the widget ID. An in-depth widget report is available in Maximus’s Campaign Details for any RevContent campaign. Implement multiple-step pixels to better optimize and account for customers who are purchasing more than one item via upsell or multiple funnels. From the landing page site reports, users can route traffic from individual sites to go to one specific landing page. 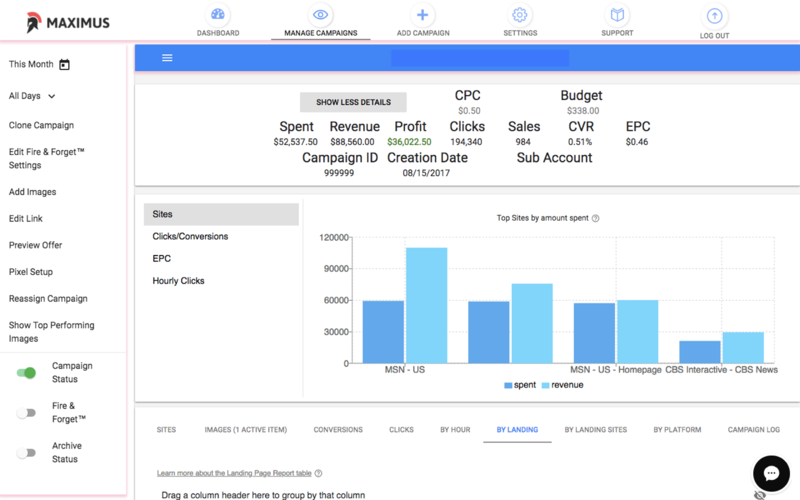 Users can quickly clone campaigns within the Maximus dashboard, giving a head start with campaign launch. Set time periods in which the CPC, both on a campaign and site level, will remain static.